Returning: Top Gear. Airdate: Mud, Sweat and Gears. For the first time, Australian viewers will be able to watch the new series of Top Gear on BBC Knowledge within minutes of it airing in the UK at 7am January 26th (replay 7:30pm). 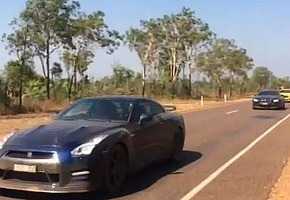 It features a segment filmed in the Northern Territory, airing in episode two. BBC Knowledge will also be showing brand new car construction and challenge competition series Mud, Sweat and Gears starting the 2nd February at 8.40pm and the one-off special Inside Rolls Royce on the 18th February at 8.30pm. Top Gear, the world’s biggest car programme, returns for an explosive and extra-long run of brand new programmes. In the first episode of the series, Jeremy Clarkson, Richard Hammond and James May are in Russia for an incredible race across the vast and very beautiful urban landscape of St Petersburg. May defends the honour of the car in a very small Renault, Hammond tries to prove that pedalling is faster by saddling up a bicycle, whilst Clarkson attempts to demonstrate that water is the quickest way across town, especially if you’re in a hovercraft. To make matters more complicated, all three presenters are racing not only each other but also The Stig, who is silently making his way towards the finish line on public transport. Also in the first episode, Richard Hammond is at the test track to find out if the dramatic new Lamborghini Huracan is as flamboyant and fun as an Italian supercar should be. Plus, another top celebrity guest tests their steely eyed driving skills as the “Star in the Reasonably Priced Car’. Meanwhile Jeremy Clarkson, Richard Hammond and James May will preview the new series in front of a live audience of fans at a special event on Top Gear’s official YouTube channel on Sunday January 18th (8am AEDT Monday January 19th in Australia). In new series Mud, Sweat and Gears, hosts Tom ‘Wookie’ Ford, Jonny Smith and their team of petrolheads go head-to-head super-customizing, super-racing and generally blowing up the craziest mutated cars this side of Mad Max! With a different theme for each episode, rival team leaders, Jonny and Wookie, select a pretty ordinary base car, then work against the clock with their team members to rip it apart and radically redesign it. Once the teams have their machines fixed up and ready to race, epic adventures unfold in a contest where literally anything can – and will – happen. In an added twist, after the thrills and spills of the three stunt challenges, the losing team has to stand by and watch as their lovingly-crafted vehicle is dramatically destroyed. Inside Rolls Royce offers a privileged peek into the exclusive world of one of Britain’s most famous luxury brands. This documentary follows the Rolls Royce team as they create The Celestial, their most expensive car ever. This one-off, bespoke car comes complete with a diamond-studded interior and its own platinum-encrusted picnic hamper. In a world where money is no object, the customer can have anything they want; from rabbit-fur detailing to their own unique paint colour. This documentary reveals the obsessive attention to detail that goes into making and selling cars to the super-rich and the extraordinary lengths the team go to in pursuit of perfection.